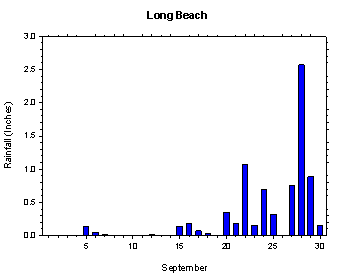 The September 28 to 30 superstorm was impressive even by mid winter standards. The fact that it struck Washington before October 1st makes it truly remarkable. From heavy rain and high winds to heavy snow, the last 3 days of September featured a plethora of extreme weather. On September 28th, the Olympia area experienced nearly 3 inches of rain, while winds gusted as high as 71 mph in eastern Washington. Well over a foot of snowfall accumulated on the 29th and 30th at higher elevation locations places like Paradise, Mt. Rainier. The cause of the inclement weather was a unique atmospheric setup and a convergence of critical factors. As cold air from Alaska poured into the North Pacific Ocean, a strong jet stream interacted with remnants of a tropical typhoon to create the massive cold core low pressure system. Following a weak weather system passage on September 27th, a stronger cold front plowed through Washington on the 28th, and delivered the first round of heavy rain and wind to western Washington. However, as surface low pressure rapidly strengthened off the coast, an even stronger front swept through Washington on the night of the 29th, and ushered in round two of the wind and rain. Heavy rain showers continued in western areas into September 30th, and strong wind persisted east of the Cascades. Thanks to a sizable contribution from the superstorm, September was very wet in western Washington. East Olympia's monthly rainfall total was nearly 10 inches, of which almost 5 inches fell during the final three days of September. In addition to the superstorm, the active weather month of September featured several other noteworthy events. The severe weather in central Washington on the evening of the 15th included heavy rain squalls, lightning, hail, and strong winds, and was undoubtedly one of the region's latest thunderstorms outbreaks in recent history. Some corn fields in the Tri-Cities area were flattened by winds of over 60 mph, while many other crops were damaged by the harsh conditions that occurred all across central Washington. Several sites in central Washington reported station record 15 minute rain totals of up to one inch during the storms. It is interesting to note that the outbreak was preceded earlier in the day by College Place reaching 101 degrees, which was the latest date that the network has ever reached 100 degrees. Stormy weather earlier in the month had also caused several debris flows and road closures on the 5th. Overall, the trend for the month can be characterized by a transition from very warm conditions early to cloudy and much cooler days later in the month. In fact, the combination of early heat, active conditions, and poor radiational cooling later in the month resulted in record warm monthly mean low temperatures around the state. 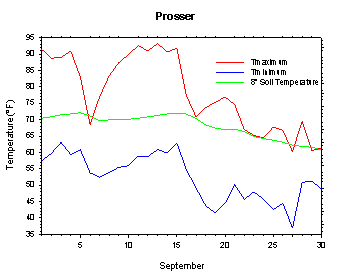 Prosser's average low temperature was 52.4 degrees, or 4.5 degrees above average, which is a record (1989 to present). This breaks the old record of 51.5 degrees, set in 1990, by nearly one degree. 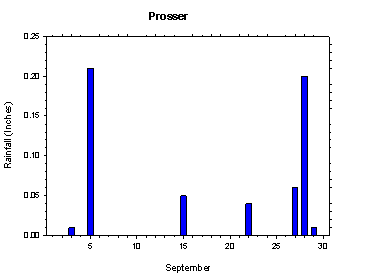 It is also the first time that Prosser's average September low temperature has been above 50 degrees since 1998. In fact, September 2013 marks the second consecutive month of record warm night-time temperatures. The last time that a larger (positive or negative) monthly temperature anomaly (high, low, or mean) was recorded at Prosser was May of 2011. The most recent occurrence of a larger positive monthly temperature anomaly was February of 2010. 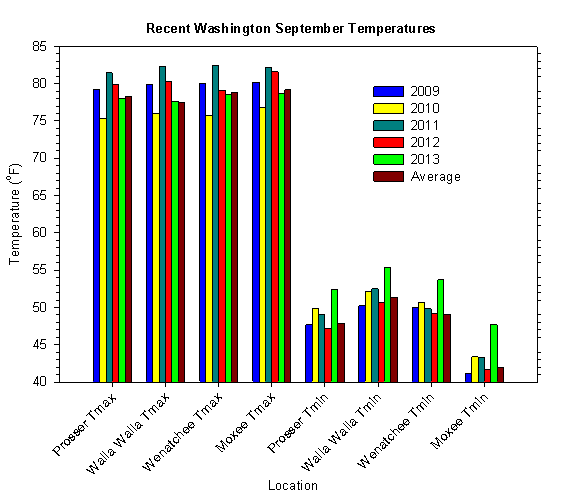 By contrast, September high temperatures were around average, which resulted in mean temperatures that were only somewhat (around 2 degrees) above average. 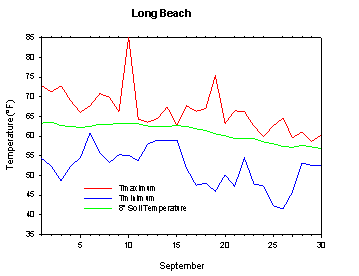 September began with temperatures as warm as the mid 90s and southerly flow aloft. Highs on the 2nd were as warm as 94 degrees in central Washington, although a late evening squall dumped nearly three-quarters of an inch of rain at McNary (east of Plymouth). Showers and storms affected mainly western areas on the 3rd, as the Olympia area recorded rain values in excess of 0.6 inches. Storms increased late on September 4th, as a moist and dynamic upper low approached the Northwest. September 5th was a very stormy day, as there were several reports of severe weather across Washington. Heavy rain yielded flash flooding, debris flows, and road delays/closures in some spots. On the evening of the 5th, SR 410 west of Naches was closed due to a landslide, while debris flows also closed the North Cascades Highway. Much of the Puget Sound region received rainfall in excess of one inch. WSU Sunrise (near Wenatchee) registered an impressive daily total of 1.4 inches, while Thorp received 1.1 inches. An additional 1.86 inches fell at Puyallup on the 6th, as storm totals reached 5 inches in parts of the Cascades. Many locations received 15 minute downpours of over 0.3 inches, including 0.44 inches during the evening of the 5th at Thorp. Concurrent temperature drops of greater than 10 degrees in 15 minutes were common. Also, the wind gusts at Mesa SE peaked at 49 mph during the stormy period. Strong wind and even hail were observed in thunderstorms, as temperatures dropped quickly. Some rain lingered into the 6th, along with clouds and much cooler temperatures. Some areas that had been in the upper 80s on September 5th failed to reach 70 degrees on the 6th. Lingering showers on the 7th gave way to sunny and warmer conditions on the 8th, with highs climbing back into the 80s in central Washington. Hot and dry weather commenced on the 9th, as Maryhill reached 92 degrees, while College Place reached 95 degrees on the 10th. Several locations east of the Cascades reached 98 degrees on the 11th, while Vancouver and Lynden (north of Bellingham) reached 96 and 95 degrees, respectively. More hot weather on September 12th sent Maryhill up to 98 degrees. High temperatures reached 101 degrees at College Place on September 15th, which is the latest that the AWN network has ever recorded a 100+ degree temperature. However, cooling finally arrived in the west, as rain developed and winds increased. Severe weather late on the 15th led to significant rain totals during numerous heavy downpours. Station records were set at Wheeler (1.02 inches) and Eby (0.96 inches) for 15 minute rainfall values. Winds gusted above 60 mph in several spots, and temperatures dropped quickly in rain squalls. Unsettled and cool conditions continued for September 16th to 18th, and then milder and drier weather returned for the 19th and 20th. The arrival of a weak system on the 20th initiated another pattern change to more unsettled weather. A stronger storm followed on the 22nd, and delivered heavy rain, wind, and cool air to Washington. The high temperature was only 57 degrees at Underwood, while East Olympia recorded 1.4 inches of rain. Highs were as low as the upper 50s again on the 23rd, while 0.71 inches of rain fell at Silverton North, OR. On September 24th, many areas reached the 60s, although Anatone topped out at just 51 degrees, thanks in part to 0.9 inches of rainfall. An additional 0.46 inches fell at Anatone on the 25th, as cool weather continued. Conditions dried a bit on the 26th, and low temperatures cooled into the mid 30s around Pullman, as well as the Whatcom County area. Rain arrived early on the 27th in the west, although dry conditions in eastern areas allowed Moxee to drop below 33 degrees. Wet and windy weather quickly returned, and September ended on a stormy note. As remnants of a tropical system became entrained in the westerlies, several strong fronts crossed Washington on the 28th and 29th. Nearly 3 inches of rain fell at East Olympia on the 28th, and winds gusted to 71 mph at Huntsville, while a couple of feet of snow fell in the high Cascades over the last two days of September! On the 30th, strong wind returned to Huntsville, where sustained speeds of 48 mph were recorded. Meanwhile, Montesano received 1.71 inches of rain, and Olympia and Puyallup recorded around 1.5 inches. Highs across the state topped out in the mid 50s to mid 60s on the final day of September. 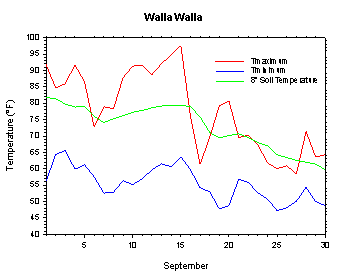 The average September temperature at Prosser (WSU IAREC) was 64.6°F, which is 2.1 degrees (1.1 standard deviations) above average. The average high temperature was 78.0°F, which is 0.3 degrees below average. The average low temperature was 52.4°F, which is 4.5 degrees (1.9 standard deviations) above average. The maximum temperature recorded last month was 93.2°F on September 13th, while the coolest daily high was 60.2°F on September 27th. 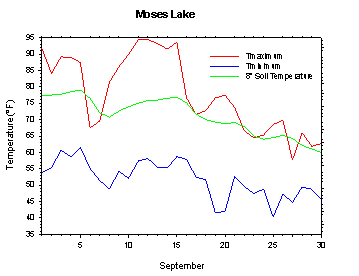 Low temperatures ranged from 63.1°F on September 3rd to 37.0°F on September 27th. Daily average temperatures ranged from 75.2°F on the 13th to 49.3°F on the 27th. The monthly precipitation total was 0.58 inches. 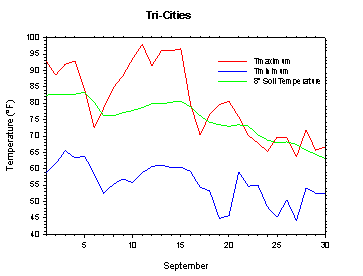 The average wind speed was 4.6 mph, and the average 8 inch soil temperature was 68.1°F. 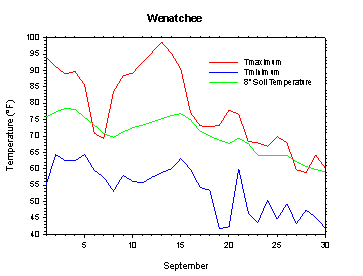 Wenatchee (WSU TFREC) recorded an average temperature of 65.4°F, which is 2.1 degrees above average, while Walla Walla's average monthly temperature of 65.4°F was 1.4 degrees above average. 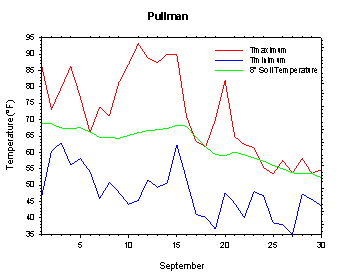 Pullman was one of the cooler spots in eastern Washington, with an average September temperature of 59.9°F. In western Washington, Mt. 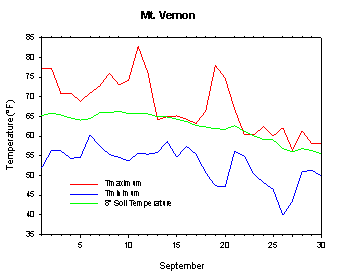 Vernon's average temperature was 59.7°F, which is 1.6 degrees above average. September 6th: 1.6 inches of rain fell at WSU Puyallup. September 15th: The high temperature soared to 101 degrees at College Place. September 15th: 1.02 inches of rain fell at Wheeler in only 15 minutes during a severe thunderstorm. September 15th: The wind at Fourmile gusted to 61 mph. September 22nd: The high temperature at Underwood rose to only 57 degrees. Variable weather was the rule in September, as the state experienced hot and somewhat dry weather early, and then cool and wet conditions later the month. The powerful storm at the end of the month brought heavy rain to western areas and strong winds to the entire state. Strong thunderstorms on September 15th led to significant crop damage in some areas around the lower Columbia Basin. Powerful winds flattened some corn fields in Franklin County, while also blowing apples off of trees (Tri-City Herald). Heavy rain and hail were also observed, with some areas reporting upwards of one inch of rain in just 15 minutes. Otherwise, harvest ramped up for one of the largest apple crops ever, as quality was reported to be very good as well. As of the 23rd, grape harvest had begun early in Klickitat County due to the warm weather during recent months, with reports of average yield and good quality (National Agricultural Statistics Service). On September 23, 2000, the temperature at Moxee plunged to a monthly record low of 23.5 degrees. According to the Climate Prediction Center (CPC), near average temperatures and above average precipitation are expected in October. Later in the fall and into the winter season, above average temperatures and near average precipitation are anticipated. ENSO Neutral conditions are most likely this winter, with the odds tilted toward being on the warm side of neutral.